Clearly, your DNA library prep was not optimal. I am not sure what's going on in your IGV images, but it's very obvious from your first (% adapter) graph that the insert size was too short compared to read length. Your IGV images look like amplicon data. Can you describe this in more detail? Did you authorize the sequencing center to PCR-amplify your DNA sample? There's no way such a high proportion of reads would have the exact same start site without amplification. Considering that none of the reads you posted agree with the reference, it looks bad. How did you align the reads? Also, the specific reference would be helpful here... and, what you are trying to do is also always useful information. I encourage you to post an insert-size histogram and detail the platform and read length used. I'm guessing you ran 2x250bp on a MiSeq, but it's not really possible to tell from what you posted. Posting those results would be useful, along with the screen output. Apologies for incomplete information,Yes these were PCR amplicons that were sequenced, I aligned the reads using bwa mem, we were trying to induce a deletion and check if worked by sequencing exon 6 of a particular gene. Oh... if you're looking for a somewhat long deletion, I suggest you try aligning with BBMap; it's very good at capturing those within the alignment of a read. Sure, some additional info about the experiment attempting to detect indels from a panel of clones resulting from CRISPR targeted deletion. Regions around the target were PCR amplified to produce a roughly 150bp amplicon, which was then sequenced with as a PE250 run. Then map the trimmed (interleaved) reads and you'll get better results. Hi, I would recommend using a program such as trimmomatic to remove your adapter sequences. It handles paired-end reads quite well. 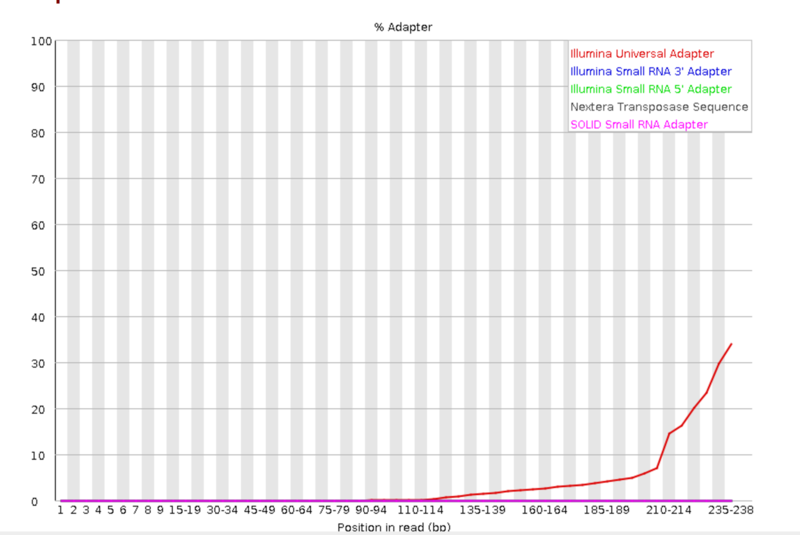 I certainly recommend removing adapters in all cases, but when >30% of reads have adapter sequence, that indicates a major problem in sequencing. I'd reject the data and have it sequenced correctly. You will not see adapter sequences that easily in the actual reads. You will need to use a scan/trim program to look for those. I recommend bbduk.sh from BBMap suite. BBMap suite comes with a comprehensive set of adapter sequences for many commonly used commercial adapters (in adapters.fa file in resources directory in BBMap software). TAGTCTTGAT+TCTTTCCC are the index/tag read sequences. IndexRead1+IndexRead2 is how they are represented in the fastq read headers. You also have separate files with the index read sequences (I1 and I2 files).